Fleeing Vesuvius is a new book about how to adapt to the challenges and predicaments that are swiftly encroaching upon us, such as climate change and peak energy, as well as water stress, habitat loss, over-population and of course economic dysfunction. The title refers to the Ancient Romans who ran away and survived when they heeded the warning signs that Vesuvius was about to erupt in 79 AD. We should heed the warning signs in this hefty 400 page tome from Irish sustainabilty thinktank FEASTA. Distilled within are contributions from 27 environmental experts in one field or another. It covers 6 themes: Energy Availability, Innovation in Business, Money and Finance, New Ways of Using the Land, Dealing with Climate Change, Changing the Way We Live, Changing the Way We Think and finally Ideas for action. Parts 5 & 6 dealing with lifestyle modification and the reasons why we are resistant to change are particularly important but I will come back to them. 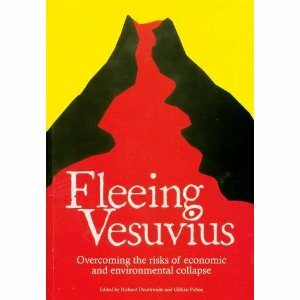 Fleeing Vesuvius: Overcoming the risks of economic and environmental collapse, is on one level a practical textbook and pathfinder for those individuals who want to move away from our unsustainable existence, on another level, it is the academic underpinning to practical theory. Because there are are wide range of contributors, it is not a narrow book pushing one particular theory at the expense of others. "The solutions it puts forward involve changes to our economy and financial system, but they go much further: this substantial, wide-ranging book also looks at the changes needed in how we think, how we use the land and how we relate to others, particularly those where we live. While it doesn't discount the complexity of the problems we face, Fleeing Vesuvius is practical and fundamentally optimistic. It will arm readers with the confidence and knowledge they need to develop new, workable alternatives to the old-style expanding economy and its supporting systems. It's a book that can be read all the way through or used as a resource to dip in and out of. " The most fascinating sections of the book, parts 5 and 6, deal with the social and psychological aspects of the changes we face. These issues have been mostly ignored, when perhaps they are more important than technical matters such as the date of Peak Oil or the concentration of Greenhouse Gases in the atmosphere, because it is how our society reacts - or mainly doesn't - and how individuals will cope with the transition to a different kind of world, that is central to whether this will be a disaster, or something we can adapt to. There are several very stimulating essays on this subject in Fleeing Vesuvius and their authors are to be commended for looking at this debate. The only difficulty with the book is that it is rather dry. Dmitry Orlov's impudent wit aside, it does read like a long academic textbook. This might be off-putting for some readers, which is a pity as it has a lot of value. Also, while it draws many of its lessons from the Irish experience, this is a European view of the circumstances we are facing, and therefore has important information and ideas for the whole continent we live on.